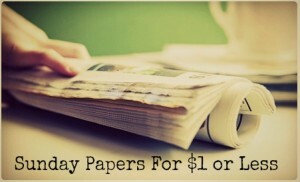 Home > Daily Deal Sites > Newspaper Sunday Subscriptions – $1 per week! Newspaper Sunday Subscriptions – $1 per week! On tonight’s Spreecast Live Q&A there were a few questions on how to find the best deal on newspaper subscriptions. My answer… look for deals on Groupon and Living Social! It was then mentioned that right now there are a few deals for North Carolina and Florida readers!! If you are in one of these delivery areas, today is your day. If you bought the Sunday paper in a local store it would be $2+ per week, so this is an awesome price to get it delivered for half the price! The Groupon doesn’t say how long it will be available, so grab it if you want it. For everyone else, just keep watching. We see many other cities pop up from time to time.